In today's society full of work, social obligations, school, and everything else, it can be difficult to relax, much less find a natural way of doing so. Have you ever given thought to trying lavender? Lavender WS 1265 from Integrative Therapeutics provides 80mg of pure lavender oil in every softgel for optimal relaxation. Lavender WS 1265 from Integrative Therapeutics provides natural relaxation support and is non-habit-forming. Find relaxation the natural, healthy way and give it a try today! 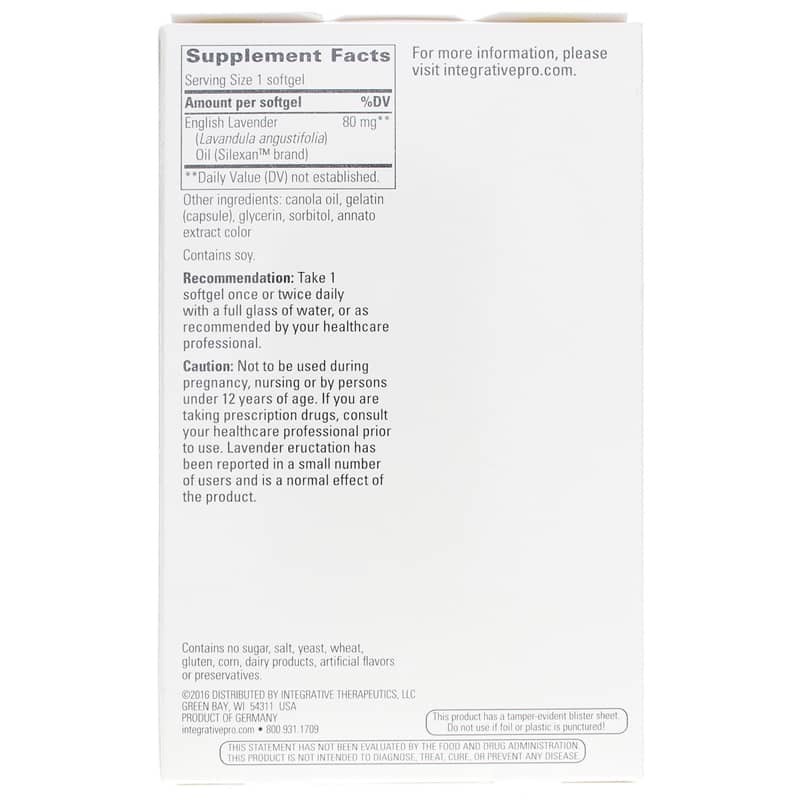 Other Ingredients: canola oil, gelatin (capsule), glycerin, sorbitol, annato extract color. Contains NO: sugar, salt, yeast, wheat, gluten, corn, dairy products, artificial flavoring or preservatives. Adults: Take one softgel once or twice daily with a full glass of water, or as recommended by your healthcare practitioner. Not to be used during pregnancy, nursing, or by persons under 12 years of age. If you are taking prescription medications, consult with your healthcare practitioner before using this product. Lavender eructation has been reported in a small number of users and is a normal effect of the product. Keep out of the reach of children. I've never had any natural remedy work this good. 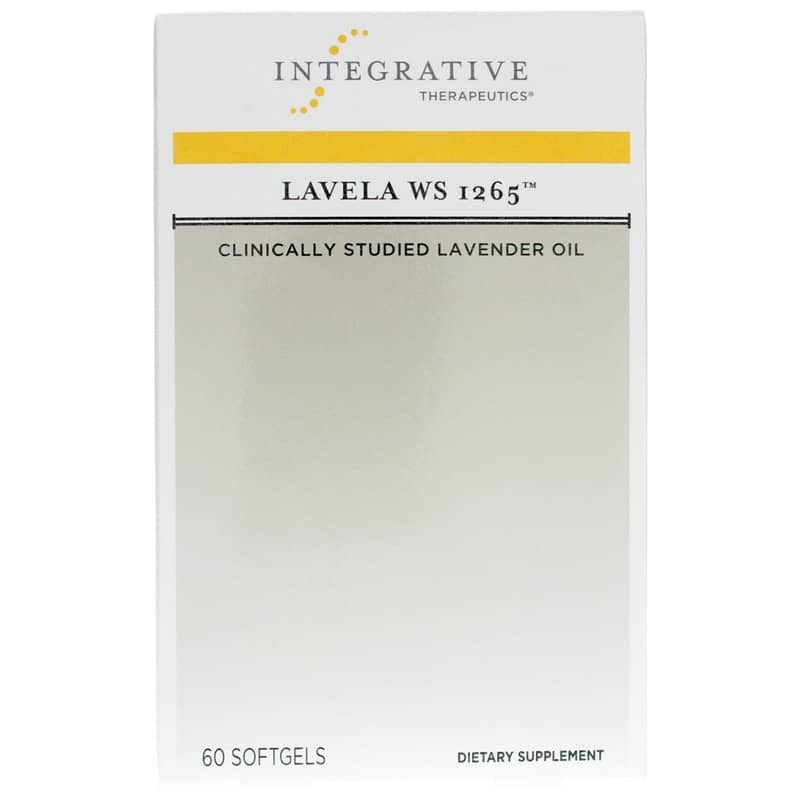 Lavela WS 1265 Lavender Oil is fantastic. Lavela helps me wind down and relax after a busy day...highly recommended! Perfect all natural option without the side effects of xanex or other drugs. I was excited to try Lavender orally. I get bad bloating within 3 hours of taking. Trailed on and off for 3 weeks. Had to stop. So didn't get a chance to see if it worked or not. It also contains fillers and artificial sweetener (sorbitol) which is likely why I got bloating. Not sure why such a strong company would add cheap fillers. Would try again if pure lavender oil was used. She was so kind to give me a sample. It works great...nice to have an alternative sleeping aide that is not a prescription drug. Just wish they were not so expensive. Bought this for two elderly family members. Both experienced the belching and had to discontinue the product. Because of this, they were unable to determine if it was effective. Might work if taken with bile? Eructation in the description means belching, and I assume it is due to the canola oil. This stuff is amazing with no harmful side effects. Lavender pills have helped with depression! Thank you! This was taken for anxiety and to elevate mood. After 2 weeks, it seems to help my son. Will keep you posted.